In many ways, we are our jewelry. Like us, our jewelry speaks and has a certain look. We have an emotional connection to our necklaces, bracelets, rings and earrings, whether we came to have them by self-purchase, got them as a gift or inherited them. Some are the picture of perfection, others…well,…they could use a little work. That’s where the jewelry repair and custom design professionals at J.R. Dunn Jewelers come in! We want you to know that we understand not only how you feel about your jewelry, but all about jewelry, too, from gold to precious stones, semi-precious stones, pearls, diamonds and more. People from all over south Florida trust us with their most precious gems (we love the word-of-mouth referrals they deliver!). Because they know us and the quality of our work and professional team. 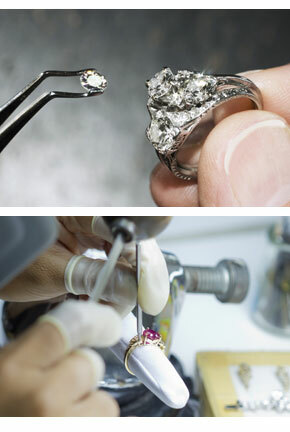 The safety and security of your jewelry is our #1 priority; that’s why all work is done on-site by our talented team. We can size your ring, replace your clasp and solder your chain –request a rush if you can't be without it for a special occasion! For complex repairs and Rolex watch overhauls that will take a longer period of time, we want you to feel at ease leaving your jewelry with us. Rest assured, we’ll treat it as if it were our own. And we won’t perform any work without your go-ahead. We’ll prepare a quote for each repair order, including an estimated time of completion, for your approval. Call 1-954-782-5000 or email us about our jewelry repair services today. Visit us today with those pieces of jewelry that are sitting in your draw; they deserve to be worn! Lost an earring? We’ll match it. Don’t like what you see? We’ll redesign it. Need a repair? We can fix it! All our work is guaranteed!